NIAGARA-ON-THE-LAKE, Ontario — During the next week, I will post full reviews of the 10 plays included on this year’s Shaw Festival roster. My intention was to file a review or two daily, but six plays in three days produce a wealth of impressions, especially when the Shaw’s creativity is taken into consideration. Rather than wait, and go another day with no new posts, I’ve decided to give a preview of reviews to by giving some impressions of the season and express appreciation for a Niagara region that is both beautiful and relaxing. Thwarted, unexpected, and changeable love seems to be one major theme at the Shaw this year. Plays generally says true love might run smooth if people, changeable, evolving people weren’t involved in it. Another is how politics, social or governmental, impinge on our lives whether we take notice of them or not. Philosophy and acquired attitudes certainly encroach. In play after play. A chestnut like Philip Barry’s “The Philadelphia Story” is given renewed luster and demonstrates the value of the well-made play in Dennis Garnhum’s intelligent production featuring a remarkably deep and funny performance by Moya O’Connell as Main Line Philadelphia socialite, Tracy Lord. 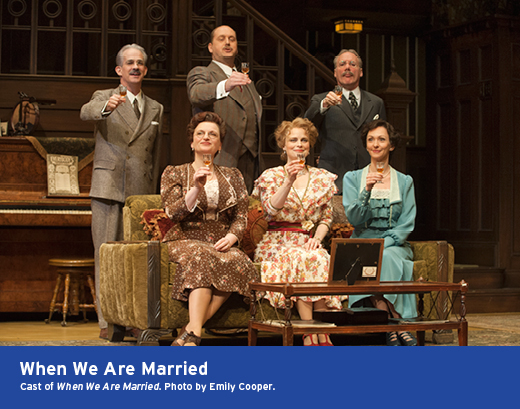 A Shaw ensemble gives a maser class in comedy while performing J.B. Priestley’s “When We Are Married,” much ado about three couples who learn while celebrating their mutual silver wedding anniversaries that none of them are officially joined in matrimony. Shaw’s “The Philanderer” is given a magnificent, sweeping production that once again shows the talents of Moya O’Connell, among others, and elicits laughs while exuding romance, expounding on the modern woman, and man, and showing how, from the beginning of his career, George Bernard Shaw was a born entertainer. Peter Hinton’s dark, dark take on “Cabaret” emphasizes different facets of the Kander and Ebb musical from any of the New York or London-originated productions I’ve seen (and I’ve seen several). The interesting thing is how much Hinton works for spectacle and the big theatrical coup while the most moving and effective moments invariably arise from intimate sequences involving two or three characters in conversation. Edward Bond’s “The Sea” fascinates while leading you to a conclusion an individualistic character played by Peter Millard encapsulates in a brilliantly articulate and sadly irrefutable speech to a young, realistic, and diligent man who may be able to benefit from his insight. Sean O’Casey’s “Juno and the Paycock” receives a poignant production that has lasting overtones as Shaw veteran Mary Haney breaks your heart and director Jackie Maxwell appeals to your emotions and your mind. A rarely produced one-act by Tennessee Williams, “A Lovely Sunday for Creve Coeur,” shows both the humor and humanistic sensibility of America’s most important playwright as a woman has to consider all that is important in her life on a single Sunday morning that could be spent waiting for a phone to ring, making a dramatic social change, nursing a nervous episode, and going with friends to a lakeside picnic. Deborah Hay, a complexly magnificent Sally Bowles in “Cabaret” is equally engaging as a Williams heroine at some critical crossroads. A stylized “Arms and the Man” concentrates on the poses people affect and comments on the nature of war more than emphasizing romance. In Morris Panych’s production, Shaw’s comedy belongs to the men as Graeme Somerville and Martin Happer provide entertaining contrast as “the chocolate cream soldier,” Bluntschli, and the preening yet self-effacing braggart, Saranoff. Garnhum’s “The Philadelphia Story” was a great and satisfying surprise because I’ve seen the play and the Hepburn-Stewart-Grant/Kelly-Crosby-Sinatra-Holm movies so often, I thought I knew Barry’s work inside and out. In terms of plot and a few key lines, I did. And do. Garnhum and company were yet able to make me look at the piece afresh by going beyond the smart, frothy plot to comment incisively on subjects as heady as prejudice, social standing, power, and individuality in addition to the expected topics of love and marriage . Barry’s lines zing. The Shaw cast finds all of their wit, bite, and in many cases, their honesty. You see that, in spite of some game playing , Barry’s characters are candid more often than not and reveal a lot about themselves while assessing the judgment and comments of others. The play supports the sensible. It says, “So what?” and asks, “Why not?” in regard to several significant situations and social mores that could be considered controversial today. Think of how novel and adult Barry’s enlightened attitude might have seemed in 1939, when “The Philadelphia Story” was new. Characters like Tracy Lord, Mike Connor, Liz Imbrie, C.K. Dexter Haven, and even Uncle Willie and his sister, Margaret Lord, have a maturity, including the four who are age 30 or younger, and outlook that reminds me why I so admire the people and attitudes of the 1940s. The growth and revelations of Tracy Lord are particularly pronounced in Garnhum’s staging. You see this familiar character, immortalized in a way by Katharine Hepburn, observe, learn, and become more complicated yet less confused during the course of the play. By the time the curtain falls on the Shaw’s “Philadelphia Story,” Tracy’s intellect, flippancy, and charm have been enhanced by a more accurate sense of self and broader outlook on what is important in life. Garnhum and actress Moya O’Connell don’t seem content to let her dominate only because the focal character. They delve into Tracy’s development as a human being. They give Tracy depth. Her native gifts of wit, breeding, and sophistication are leavened by a new awareness and understanding of people and the need to look at them from a variety of angles. Tracy is ready to make wise rather than rash or expedient choices. She sees the difference between whim and true love. She knows who she is and what she wants as opposed to presenting herself as she’d like to appear and opting for what she is expected to want. O’Connell is extraordinary. Her line delivery and expressions are great sources of comedy while showing how glib, commanding, perceptive, and reactive Tracy can be. O’Connell doesn’t play a type. She plays a complete woman, one who goes beyond hauteur and privilege, and even beyond education and verbal quickness, by taking in all of the variables around and becoming a more informed independent spirit. A large black metal spiral staircase, mounted on a turntable, dominates the set of Peter Hinton’s “Cabaret” that is as expressionistic as much of the art of the Weimar period in which Joe Masteroff, John Kander, and Fred Ebb’s landmark musical is set. The staircase is used creatively, sometimes for grand effect and interesting entrances and exits, sometimes in ways that occlude focus. There are also times when the staircase becomes “the monolith” in the middle and gets in the way. Hinton’s approach to “Cabaret” recalls past productions while being fresh and new. He concentrates more on the ill-starred relationships between Sally Bowles and Cliff Bradshaw and between Fräulein Schneider and Herr Schultz and uses Juan Chioran’s Emcee as more of a commentator than as a full character. Bradshaw, after being shunted aside in most productions of the last 20 years, emerges as a lead equal to Bowles or Schneider. 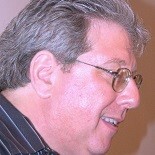 The Emcee, although Chioran gives the final bow, is a supporting player. Kander and Ebb have given directors a lot of material, and Hinton uses some of it in new ways. The first occasion of the Nazi anthem, “Tomorrow Belongs to Me,” seems sudden and out of place. The second rendition is chilling and shows that Hinton is reversing the interpretation of the well-known Sam Mendes production currently on Broadway to bring about an more insidious effect. Hinton’s “Cabaret” is hit and miss. It works hard to use the central staircase for grand designs and dramatic impact. The irony is the Shaw production works best when the focal characters — Sally, Cliff, Schneider, Schultz, and Ernst Ludwig — are in close conversation or cutting confrontation. Hinton’s production is more interesting as an idea for how to present “Cabaret” than it is successful in bringing the show to full life. The director may have out-thought himself in realizing this staging. Line readings and physicality are the keys to the outstanding productions of “When We Are Married” and “The Philanderer.” Both stagings show the actors’ art in full, as timing becomes as important as plot, and dialogue delivery maximizes all Priestley or Shaw provide for their characters to say. “Juno and the Paycock” becomes haunting and moving while retaining O’Casey’s humor and accentuating scenes of celebration as reality, political and financial, encroaches on the Boyle family. “The Sea,” as directed by Eda Holmes and acted by a perceptive cast, shows the way life in a small town affects its inhabitants and determines what is to be thought and how things are to be done. Class structure prevails, and trouble lies when ideas outside of the provincial norm take hold. Holmes’s production mines all of the intellect and comedy of Bond’s play and is a remarkable production. Williams’s “A Lovely Sunday in Creve Coeur” is a sweet and telling piece that smacks of the author’s signature traits, including his marvelous talent for storytelling and language. Deborah Hay, Kate Hennig, Kaylee Harwood, and Julain Molnar assay four different kinds of women living in St. Louis in the ’30s. Hay’s character is the one in flux, and the actress is wonderful at compactly showing all the traits of a schoolteacher who aspires to more romantically and socially. “Arms and the Man” is the odd duck in the Shaw season. It is stylized in a way that exaggerates its heroine, Raina’s romantic notions, but Morris Panych’s staging never gets to the heart of Shaw’s comedy as a love story or as a piece about man’s penchant for bravado. As promised, full reviews of the Shaw Festival’s plays, including “The Charity That Began at Home” and “The Mountaintop” will appear shortly. This entry was posted on August 9, 2014 by nzoren in Theater Reviews and tagged A Lovely Sunday for Creve Coeur, Arms and the Man, Cabaret, Canada, Deborah Hay, Juno and the Paycock, Moya O'Connell, Niagara-on-the-Lake, Ontario, Shaw Festival, The Philadelphia Story, The Philanderer, The Sea, Theater, When We Are Married.